I must be my mother's son. When things get bad my instinct is to feed people. Perhaps it's just the distraction that cooking provides under difficult circumstances. When there is little that can be said or done to help, providing food to tired and emotional people is at least somewhat useful. Despite everything, Christmas has been enjoyable. I have been spoiled with foodie treats and I'm sure that over the next few days/weeks I will go into those in more detail. For the moment I just wanted to mention some rather unusual drinks and nibbles which we "enjoyed" here before heading to my parents' house for the Christmas feast. I've been reading about the potential benefits of humans turning more toward eating insects. They are, apparently, a rich and very efficient source of protein. So, I decided to put my money where my mouth is and purchased a small selection of entomological delicacies via a website. My family and I were tucking into the more usual pre-dinner staples of cashew nuts and crisps, when I remembered my purchases. 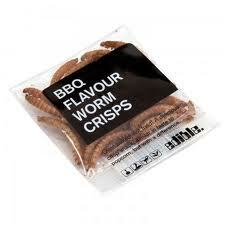 We snacked on BBQ Worm Crisps and Thai Green Curry Crickets, followed by Chocolate-covered Giant Ants, all washed down with a delectable rosé port. Some of our guests turned up their noses at these delights but those who did try them responded with a resounding "OK, really" or "not that bad". After overcoming his initial squeamishness my six-year-old nephew decided that he liked them all but that the Chocolate-covered Ants were his favourite. I'm intending to track down some locust meats in the New Year. I've heard that they're quite like prawns. Thai green locust curry here we come.